Rockland is a town of the middle west sector of the hiking trails of the south shore. It is an easy town to reach by route 3. Traffic can be high volume at rush hours but in general it is not much of a problem in this town. has trails that seem to have more hills than rocks. Nice feature in an area that is generally viewed as flat by most hikers. As with many of the towns of the hiking trails of south shore, Rockland was once part of another town. When towns once contained many other towns or areas of other towns, they are referred to as "old" during that time period that the many towns were one. Rockland was part of Old Abington till it separated in 1874. Rockland was originally settled in 1673 with only a few scatterings of settled areas by European settlers. One of these settlers being a merchant named Timothy Hatherly. Records state that approximately 2/3 of the present land known as Rockland were of the Hatherly trust. When the town seal was decided upon it was the Hatherly coat of arms that was used in it's design. Like most towns of the area Indians were here first. The true first white settlements in Rockland did not occur till the mid 1700's while Abington was still the center of the community. Rockland was generally considered too rocky for farming, yet some farming did exist. It's early industry was grist and saw milling providing timber for early ship building. Later in the 1800's came the shoe industry of which was the primary industry that helped cement a true community that became Rockland. Then came a dispute about how funds were disproportionally allocated to schools. More of those funds went to Abington central schools and those in the outer areas of the east and south with less. This led to the towns separating. 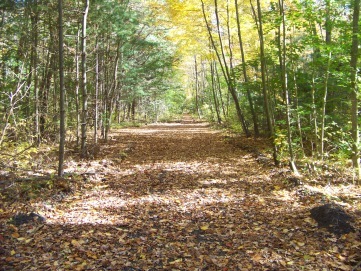 Rockland is varied and plentiful with it's hiking trails. Several have been recently developed or are in the making. This one is my favorite. It's close to home so I visit often. AND I like to see what new developments have taken place. If this little park is known to you, then you know it's gone through quite a transformation in the last several years. Before the work began it started as a cute little park with a couple of picnic tables and a couple of walking loops that were only long enough for a short stretch of your legs. Land was acquired from a nearby builder. 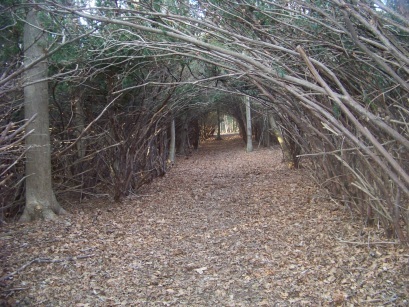 This addition connected other parts of the forest enabling a trail to be added at the end of one of those loops. This trail stretches to the far side of the property at Spruce st. Much trail work including bridges and lots of stone work has taken place since that addition. 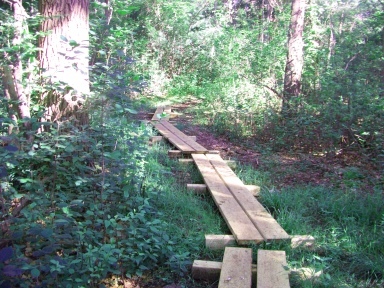 Once the main trail was put in place the, blue loop trail (as it was originally called) was then carved out and developed. It has since then been named Don's trail. 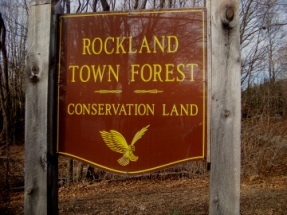 The Rockland town forest can be accessed on North Ave (route 139) on the Rockland/ Abington border. There is a parking lot that can accommodate approx. 3 cars maybe 4. Another parking lot with a gate is located at the Spruce st end again on the Rockland / Abington border but the gate is closed. Hiking in the forest is generally very easy. The trails are clear and many times lined. No need to look for any trail markers here! What may get in the way of a hike here is WATER. Most notably in the early spring. 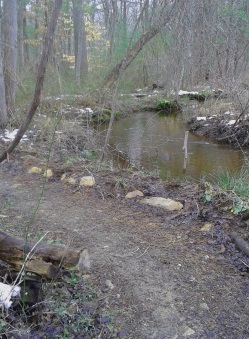 The trail runs alongside a stream. In high water times there are run offs everywhere. there was so much rushing water in the area that the large heavy planks that were used as the first bridge work were washed away. Those have mostly been replaced with the permanent well built bridges that now exist. become submerged in water. These parts aren't usually affected at all the rest of the year. Waterproof boots are highly recommended this time of the year or anytime after heavy rains. Actually visiting the forest in the spring can be an exciting time as the whole area "comes alive". 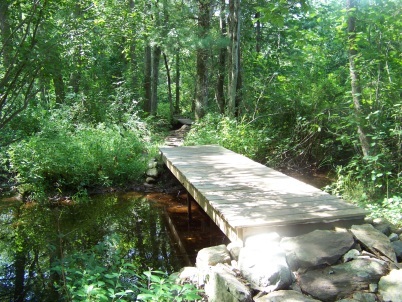 The Rockland Town Forest Tour is a hiking trail loop that links all three trails of the forest together to form a 2 mile route. The "tour" attempts to include all that the forest has to offer! 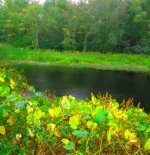 The Rockland Fireworks Trail usually accessed in Hanover at Forge Pond Park loops into Rockland on a wide pleasant trail great for bicycling and many other uses. Part of the former National Fireworks Company land. 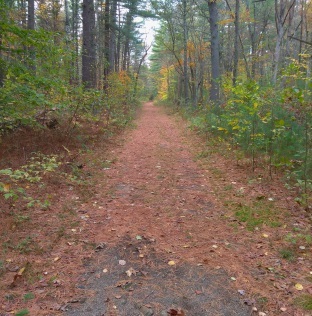 A wide gravel road that follows the line of an old rail bed, this trail is a great way to get around Rockland! Part of the redevelopment of Union Point, this trail loops through the forest on the Abington/ Rockland line.